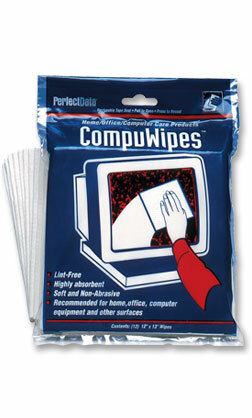 CompuWipes will not mar, scratch or leave behind potentially harmful lint like normal paper towels. Soft and absorbent yet extremely tough, strong and durable, these wipes can even be washed and re-used! Designed for home/office electronics and other sensitive surfaces. Each wipe measures 12" x 13" and is packaged 12 wipes per resealable bag.